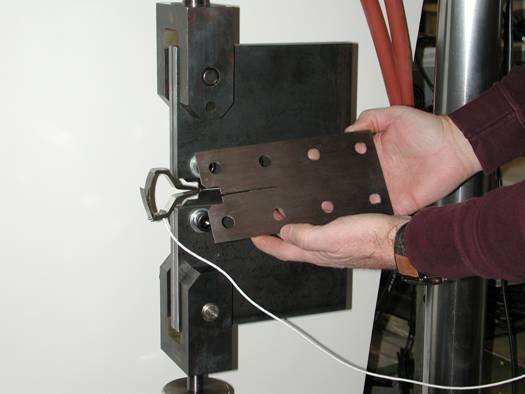 On May 7, 2008, MML and Mississippi State University co-hosted a workshop to discuss recent advances in fracture toughness testing of structural materials. This workshop entitled "Crack Tip Opening Angle (CTOA) Applications in Pipeline and Aerospace Structures" was held in conjunction with the ASTM meeting in Denver, Colorado and was attended by approximately 50 representatives from the United States, Canada, Switzerland, Germany, and Belgium. The presentations and discussion focused on a single measurement method, the Crack Tip Opening Angle test, which was first developed in the 1990s to predict the residual strength of aircraft structures. This test takes into account the complex stress-strain distributions and non-uniform material flow that often result from plasticity at a crack tip, providing a better prediction of unstable crack propagation than other methods. More recently, the pipeline industry has been adopting the CTOA test for predicting fatigue characteristics of new pipeline steels, as these materials undergo complicated ductile fracture and crack arrest processes due to environmental issues such as gas decompression and crack bulging. The workshop participants reviewed CTOA standardization efforts and assessed suggested improvements. MML presented comprehensive results for five different pipeline steels of varying strength levels, which were provided to NIST by British Petroleum Exploration. MML also addressed ways to improve the optical assessment of the crack tip opening angle to substantially reduce measurement uncertainty. The findings from this workshop will serve as a catalyst for future modification of CTOA standard ASTM E2472 to improve data accuracy and ensure applicability to the pipeline industry.